Recently, I was asked to setup server-based authentication from Dynamics CRM 2016 to SharePoint Online. Step 1, read through the TechNet article and make sure all the prerequisite stuff was complete on the CRM installation. System Administrator security role. This is required to run the Enable Server-based SharePoint Integration wizard in Microsoft Dynamics CRM. 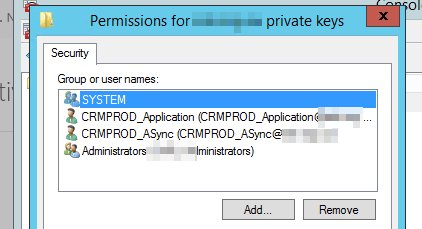 Step 2, using the TechNet article start making the changes on the CRM server, until as usual something goes wrong! 🙂 The article, while generally easy to follow, I found myself getting tripped up on the SharePoint Integration Wizard steps (in CRM 2016), getting errors on the validation steps. Once permissions were reapplied the process continued without any issues. This is fantastic as it’s solved a problem that I have been working to fix for months. My issue was that the app service account that CRM was running under was NETWORKSERVICE and this had no read access to the private key. Once I added the permission and restarted the services, it all sprung into action.